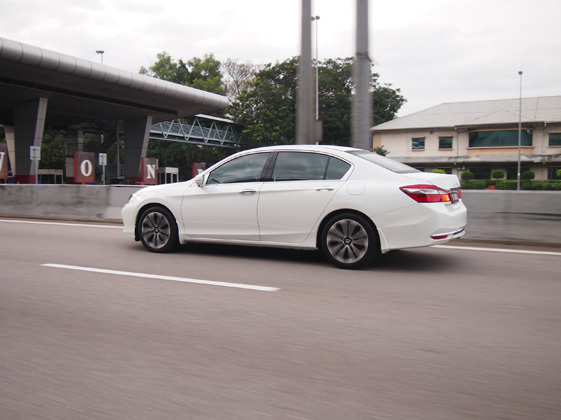 Crisply styled and aerodynamically efficient, this is the 9th generation Honda Accord which is the most sophisticated in the Accord nameplate’s history. 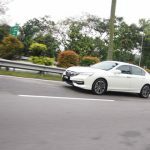 Every aspect of the body is tailor-made to improve every aspect of the Accord ownership experience, from more precise ride and handling to a quieter interior environment, along with enhanced visibility and increased fuel efficiency. 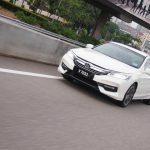 The development work on this 9th generation Accord sedan body has centered on increased rear body rigidity in order to significantly improve both ride quality and handling. 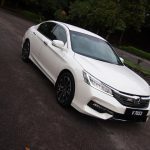 This Accord models feature sportier, more sophisticated and expressive styling cues, including restyled front and rear bumpers fascia, a new grille and new taillight designs, as well as new wheels. There is a more sharply creased and contoured aluminum hood replaces the steel hood on earlier versions and meets up with a brighter, more pronounced front grille. 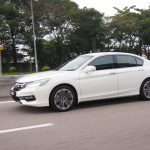 The new more expressive face of Accord is complimented by a more sharply sculpted rear bumper fascia and new LED taillight design. This Accord 2.4L rides on 235/45/18 tires. 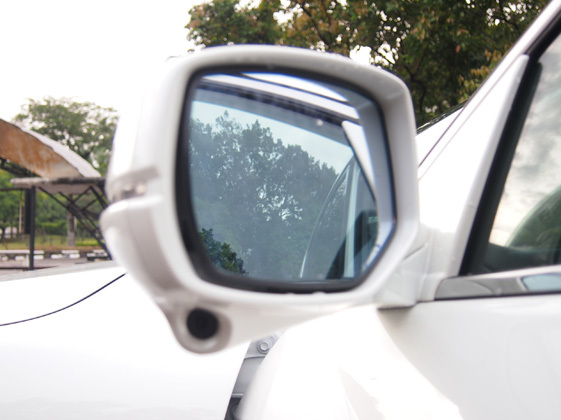 The passenger-side mirror includes an integrated Honda LaneWatch™ camera. 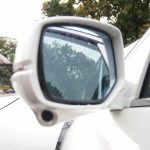 The new Honda LaneWatch™ display uses a camera located below the passenger-side mirror to display an expanded rear view of the passenger side roadway on the intelligent Multi-Information Display (i-MID). 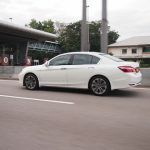 The Smart Entry system with engine start/stop button on Accord simplifies approaching, entering and starting the Accord – especially when the driver is carrying personal items. 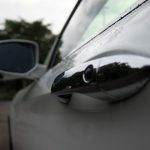 The Smart Entry system allows the driver to walk up to the vehicle, touch the door handle to unlock the door, start the engine and shut it off at the end of the trip using a push button ignition switch, and then get out and touch the lock button on the door handle to secure the car – all without ever touching a key. The system only requires that the driver has possession of the Smart Entry key. 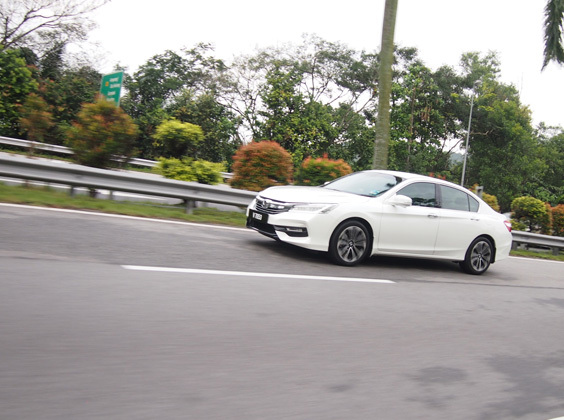 Generation after generation, the Accord’s ability to filter out noise, vibration and harshness (NVH) from the ride experience has become measurably better. 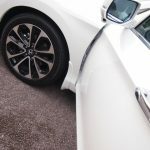 For the ninth-generation Accord the reduction efforts are even more impressive, beginning with structural improvements in the unit-body and the greatest use of high-tensile steel in Accord history. The exceptional rigidity of the unit body reduces bending and twisting, which directly improves NVH characteristics. 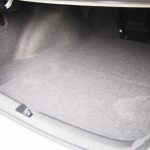 The Accord has a rear boot capacity of 15.8 cubic feet – 1.1 cubic feet larger than the previous-generation Accord Sedan’s, and is spacious enough to easily accommodate 4 large golf bags. This new Accord feature a standard multi-angle rearview camera with three viewing angles – wide view, normal view and top-down view. Drivers may select the preferred view according to driving conditions. 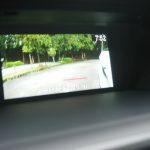 All rearview camera systems also feature dynamic guidelines for easy tight space parking. 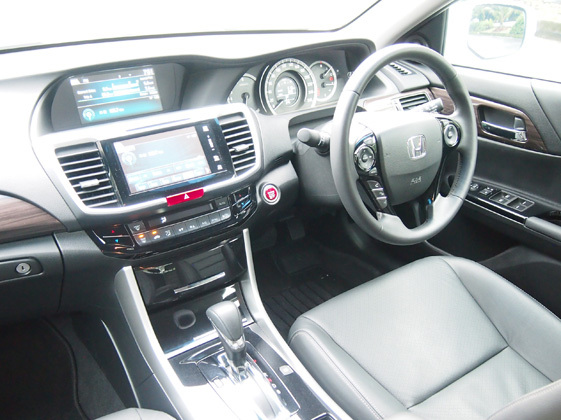 The Accord’s interior combines welcoming comfort with an impressive new range of standard and available technologies. 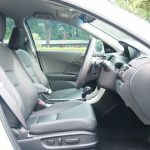 Ergonomically designed seating and features like dual-zone climate control enhance passenger comfort inside the roomy cabin, and the operation and positioning of controls and instrumentation help the driver feel in command and control. 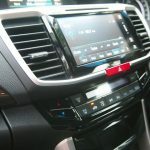 The Accord audio and digital experience is also significantly upgraded with the application of a new 7-inch Display Audio touchscreen interface featuring Apple CarPlay®. Smartphone pairing is now simplified. The driver gets an 8-way electric seat and the front passenger has a 4-way power seat. 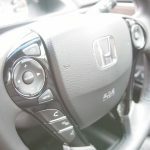 Inside the Accord, all tactile surfaces, from the interior door handles to the seat controls to the instrument panel, steering wheel, and switchgear are designed to be pleasing to the touch – and easy to operate. The upper instrument panel is now one seamless piece of soft-touch material, the product of a new in-house Honda manufacturing process. 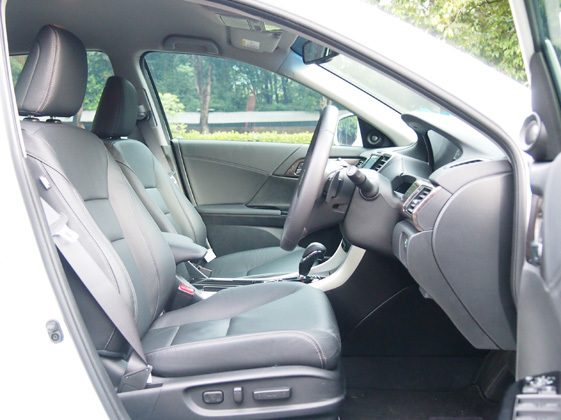 This soft upper pad has an improved fit, a luxurious finish and an integrated passenger-side airbag cover. 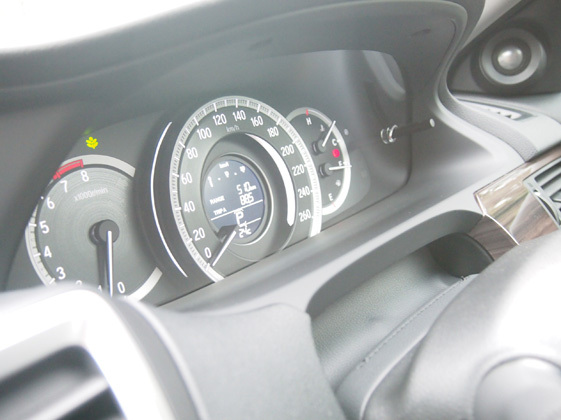 During the design of the 9th-generation Accord, the designers created a highly functional and intuitive interface between the vehicle and the driver. 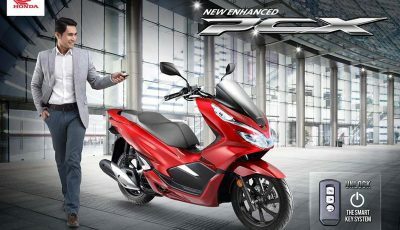 Key design features include large analog instrumentation complemented by the new upper 7-inch color “intelligent” Multi-Information Display (i-MID) positioned high in the central part of the instrument panel. All Accord models come with an Eco Assist™ function. Located on either side of the speedometer, Eco Assist has illuminated arcs that show if the vehicle is being driven in an efficient style. 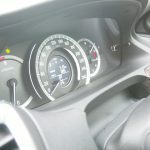 The system operates in essentially the same manner as on other Honda models, in this case with white and green “coaching” arcs that illuminate on either side of the speedometer. 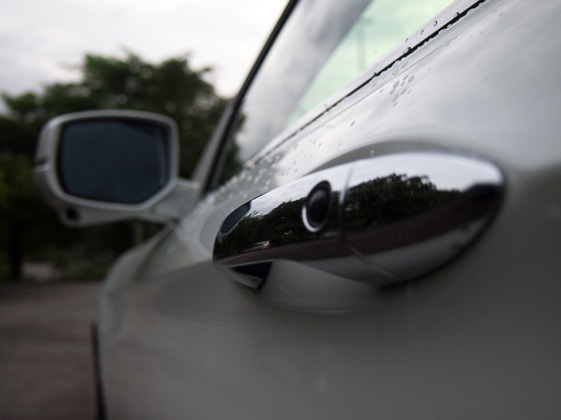 A white color signifies inefficient driving, while green means a more efficient driving style is being used. 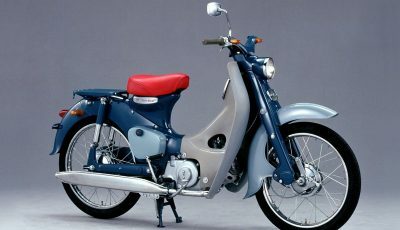 The color changes gradually in response to overall driving style. 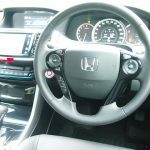 Every Accord with a CVT or automatic transmission is equipped with a green ECON button to the left of the steering wheel. When the button is pushed to activate ECON mode, several operating characteristics of the vehicle are modified for enhanced fuel efficiency. The Drive-by-Wire throttle system provides more gradual response, and to save additional energy, the climate controls fan speeds are lowered incrementally and other climate control system characteristics are altered based on the conditions. Another push of the ECON button reverts all systems to their normal mode. 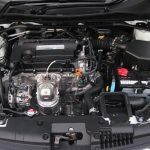 The direct-injected (DI) 2.4-liter inline 4-cylinder engine is the most powerful engine offered in a Honda sedan to date mated to a sporty and fuel-efficient continuously variable transmission (CVT). The direct-injected 2.4-liter i-VTEC inline 4-cylinder powerplant is the base Accord engine, providing 175 horsepower and 225Nm of torque. This Honda Earth Dreams® Technology engine features a set of next-generation technological advancements, which greatly enhance both driving performance and fuel efficiency. 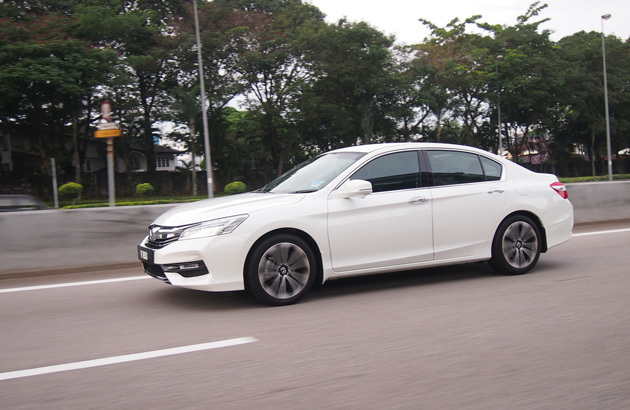 Befitting the Accord’s mission as an engaging and responsive everyday driver, every aspect of the chassis engineering and components was reviewed for the 9th-generation design. 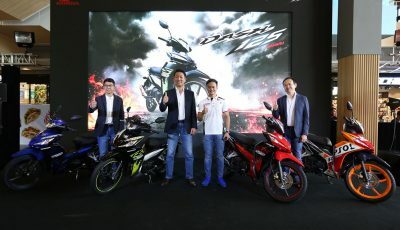 The result is a car that is quieter and more responsive on city streets, quieter and smoother riding the highway, and even more faithful to the driver’s wishes on winding roads. 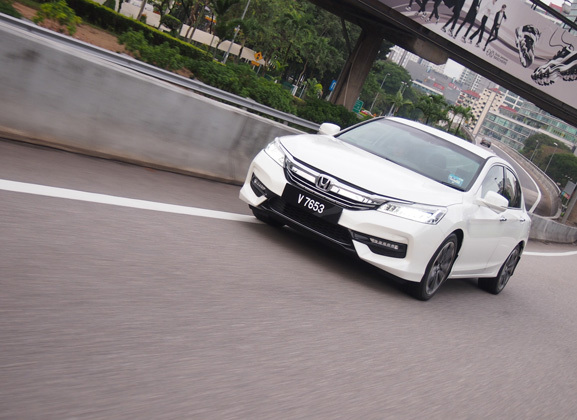 Accord chassis features include a MacPherson strut front suspension, a “hybrid” steel and aluminum front subframe, and electric power steering (EPS). Active Noise Control (ANC) and Active Sound Control (ASC) are also included, counteracting engine noise and helping to create a more linear and sophisticated high-rpm engine note. Four-wheel disc brakes along with Electronic Brake Distribution (EBD) with Brake Assist, a 4-channel Anti-lock Braking System (ABS), Vehicle Stability Assist™ (VSA®) with Traction Control, and a Tire Pressure Monitoring System (TPMS)is included. Hill start assist is also standard, helping the driver accelerate smoothly from a stop while on an incline. 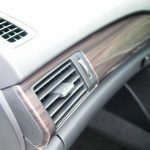 There is little or no issue with this sedan when you are behind the wheel. It delivers enough power when needed, it cruises very confidently on the highway and your passengers will not complain about excessive noise inside the cabin. 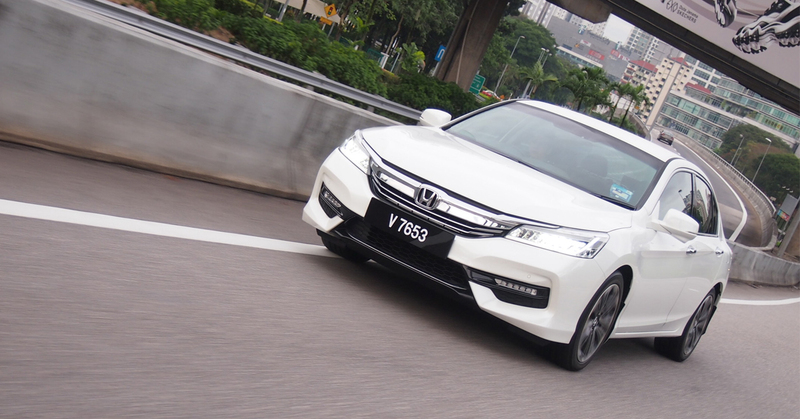 Creature comforts are provided and this Accord again ticks all the right boxes for the buyer in this segment. Purchase choice is left to brand image and the vehicle design.